Glaucoma is one of the leading causes of preventable blindness, believed to affect more than 70 million people worldwide. A study by the National research strategy for ophthalmology discovered that 500,000 people in England and Wales alone suffer from some type of Glaucoma, that’s about two out of 100 people over the age of 40, and astonishingly half of these people are gradually losing their sight and completely unaware of their condition. Future Sight Loss UK who analyze the incidence, distribution and possible control of diseases and other factors relating to health found that the detection, treatment and provision of Glaucoma will cost more than £5billion within the next decade due to an increase of around 27% being registered blind because of Glaucoma. Some people can lose up to 40% of their vision before they are even aware there is a problem, so if you thought your vision was good just because you can still read the article, think again! Regular eye examinations are not simply to obtain a new prescription and new glasses, they are essential for the general health of your eyes and vital for controlling serious visual loss from glaucoma and other ocular conditions, early detection and treatment are key for the prevention or slow down of further damage by glaucoma. The disease has no symptoms, pressure within the eye slowly rises which can damage the eye’s optic nerve, additionally a weakness in the optic nerve may also cause damage both resulting in a loss of vision peripherally and if left undiagnosed can result in blindness. The optic nerve is a motor nerve that connects the light sensitive layer of the retina with the brain. This nerve penetrates from the rear of the eye sending all information from the retina to the brain where it is perceived as a picture. See Figure 1 below. 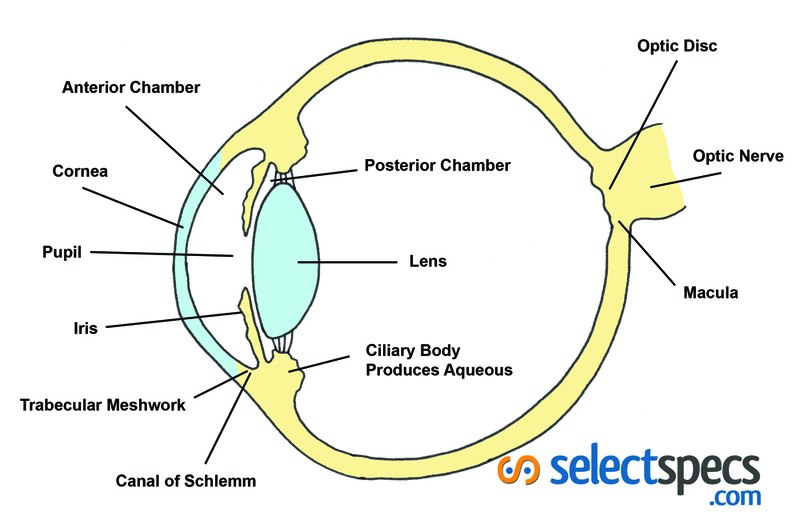 A watery fluid called Aqueous is produced by cells behind the iris that we see as the coloured part of the eye. 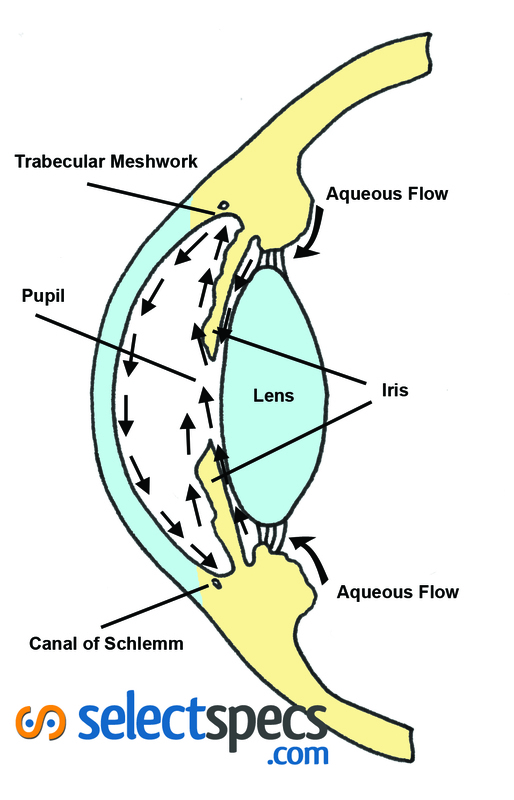 Figure 2 illustrates how Aqueous flows between the iris and the lens through the pupil and into the anterior chamber, where every minute, about 1% of its volume is removed from the eye via tiny drainage channels known as the trabecular meshwork and into the canal of schlemm to be removed into the blood stream. If this Aqueous fluid does not drain due to a blockage or too much is produced faster than it can escape then the pressure in the eye will rise. It is important to note that the aqueous fluid is not related or connected to tear production. The optic nerve is sensitive to pressure; too much pressure will cause varying damage subject to how much pressure there is and the duration it is exposed to this pressure. Other factors such as the blood supply and any weaknesses in the optic nerve can also contribute to this damage. The normal intraocular pressure (IOP) within the eye has an average value of 15 to 16mm Hg.. Glaucoma is characterized by an IOP over 21mm Hg., high pressure will damage the optic nerve promptly. A lower level of pressure can cause damage progressively over a longer period of time where sight would gradually be lost if not treated. This is considered as the most common of the four, sometimes referred to as Chronic Glaucoma, chronic meaning a slow progressive condition. This type of Glaucoma affects at least one person in 200 over 40 years of age; regular eye check ups are essential to monitor the health of your eyes if diagnosed with open angle glaucoma. 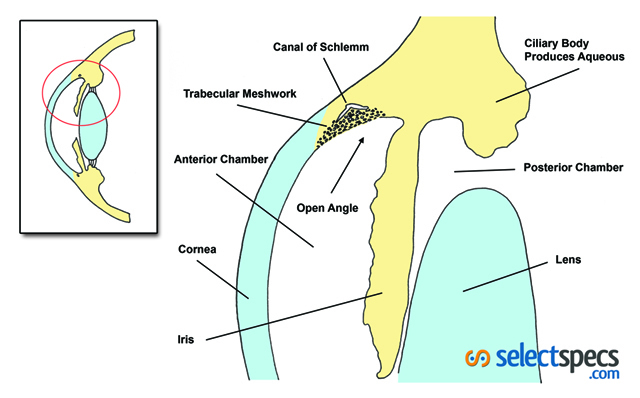 The pressure within the eye rises very slowly over many years due to a blockage in the drainage channels known as the trabecular meshwork and canal of schlemm; this is where the aqueous fluid returns to the blood stream. Figure 3 illustrates Open angle glaucoma below. The raised pressure is transmitted to the optic nerve damaging the retinal nerve fibers and reducing their blood supply resulting in a gradual peripheral visual field loss but with no pronounced pain or changes to your prescription. The loss of vision is usually in an arc shape, shown below in grey, figure 4 as arcuate scotoma following the course of the retinal nerve fibers, which can spread inwards and outwards, central vision is typically affected last causing a tunnel vision effect. 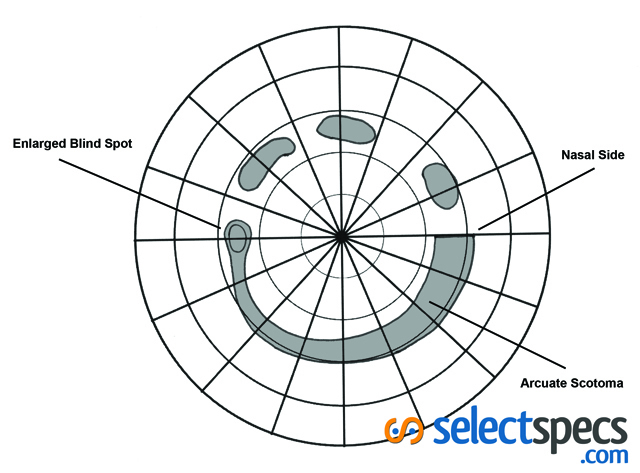 A visual field test – small spots of light are randomly shown on a screen for you to confirm which can be seen. Those most at risk of open angle glaucoma are short sighted (High Myopia), Afro-Caribbean origin, people with Diabetes or high blood pressure. A referral to the consultant at the hospital will be made by your optician with the aim to reduce the pressure in your eyes; typically this treatment simply involves eye drops. These eye drops will be responsible for opening the drainage channels so that excess aqueous fluid can drain away appropriately or by limiting the production of aqueous fluid. Surgery may be necessary if the eye drops are not successful. Your consultant may suggest laser treatment or an operation known as Trabeculectomy depending upon your particular case. Closed angle glaucoma is more common among people of Chinese origin and less apparent in western countries affecting one person in 1000 over 40 years of age, this is sometimes referred to as Acute Glaucoma. Symptoms include blurred vision, coloured haloes around lights, and a red, painful eye or eyes, which could be sever enough to cause nausea and vomiting. 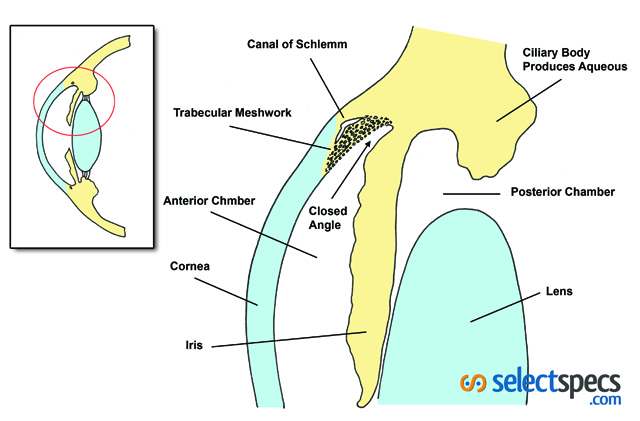 Closed angle glaucoma is brought about by a rapid increase in pressure caused by a shallow anterior chamber whereby the iris and the front of the cornea come into contact obstructing the flow of the aqueous fluid from draining. This type of glaucoma should be treated immediately at your local hospital to relieve the pressure and pain. Medication will be required to reduce the aqueous production in the eye and improve its drainage. The long-term treatment would involve surgery; this would usually be done by laser treatment, which is not painful. If closed angle glaucoma is left untreated it may cause loss of sight in the affected eye however if treated promptly the recovery of vision will be more or less undamaged and permanent. Open angle, closed angle and congenital or developmental glaucoma are all known as primary glaucoma’s as these are not related to any other ocular disease. The most common causes of secondary glaucoma’s include inflammation of the iris (Iritis), Hyphaema where blood may have been present for some time in the anterior chamber, Iridodialysis; detachment of the iris from the ciliary body, or post cataract surgery. Initial treatment for secondary glaucoma is to control the underlying condition. Congenital or developmental glaucoma is very rare but potentially serious in babies. This condition is caused by a malformation in the eye and is often determined genetically. Early signs of a raised intraocular pressure (IOP) in infants are excessive flow of tears and extreme sensitivity to light (Photophobia). This condition tends to be slightly more common in boys than girls. Visual field loss and stretching of the ocular tissues will cause myopia (Short sighted vision) as a result of the raised IOP. Congenital glaucoma must be treated with surgery to dissect the drainage channels to allow for a continuous flow of aqueous fluid. The Driver and Vehicle Licensing Authority (DVLA) state that people driving must meet the recommended national guidelines for visual fields when diagnosed with glaucoma by an Ophthalmologist. A visual field test is preformed during or following an eye examination where small spots of light are randomly shown on a screen for you to confirm which can be seen, any points missed will be plotted on a field of results sheet for your ophthalmologist to review. Assuming the loss of visual field is not too advanced driving will still be possible, you will need to confirm this with your ophthalmologist or obtain a leaflet about driving from The International Glaucoma Association (IGA). Regular eye examinations are fundamental for the health of your eyes and vital for controlling serious visual loss from Glaucoma, early detection and treatment are key for the prevention or slow down of further damage by glaucoma. If low vision aids are required your optician or optometrist can advise you of the best solution and whether you would be eligible to register as sight impaired (partially sighted) or severely sight impaired (Blind). The Royal National Institute of Blind People (RNIB) offers a Helpline for advice and products from both RNIB and other organisations. If you need to know more about your eye condition they are only a call away. The Royal National Institute of Blind People (RNIB) is available Monday to Friday 8.45am to 6.00pm and Saturday 9.00am to 4.00pm. If calling outside of these times a message can be left and they will get back to you as soon as possible. Unfortunately, RNIB can only answer email enquiries from within the UK. But you may find an organisation for people with poor sight in your country through their agencies database. The Royal College of Ophthalmologists is unable to comment on individual patient care.